We all know Google search is the best way to find news, concert clips, and funny cat GIFs, but when it comes to local happenings, it can be hit or miss. But a new feature baked into Google’s search tools on your phone is designed to fill up your social calendar. 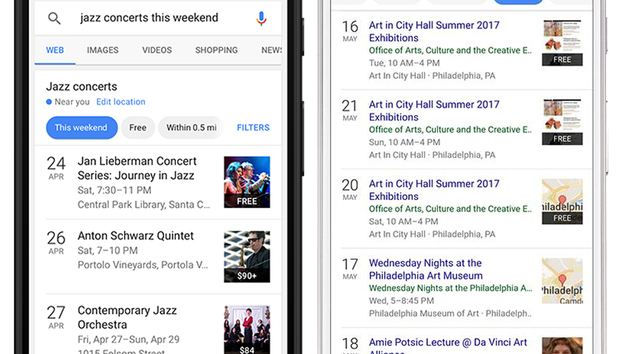 In the latest update to the Google app on Android and iOS (as well as anywhere else you can find a search bar on your phone), you should begin seeing a new interface for local events. For example, when you search for “concerts this weekend” you’ll see a new Events tab at the top of your search results. You’ll be able to quickly view events happening today, tomorrow, or next week, all presented in a calendar-style view that lets you easily see the date, time, and location. Tapping “more events” will expand the view to see additional dates, and you can tap again for more details or to buy tickets. The new interface doesn’t seem to be live yet, but Google says it will respond to a variety of queries, including something as general as “events near me.” The results will largely be populated by popular sites like Eventbrite and Meetup, but Google is also encouraging promoters to mark search terms as events to keep results varied and current. It’s unclear whether an update to the Google app will be needed to use the new events interface, but it should be rolling out to browsers on iOS and Android shortly. Why this matters: We use Google for just about everything, but unless it’s a major event, it’s not always the best way to find something to do in our neighborhood. With a new focus on local events, Google could become our go-to planning tool as well.